Wash the skin and cut squash in half lengthwise, crosswise or in 1-inch rings. If squash is too tough to cut, microwave or bake for a few minutes until squash is warm to the touch and soft enough to cut. Remove seeds and stringy fibers with a spoon. Cook squash. The squash flesh should be easily pierced by a fork when done. Microwave (shortest cooking time). Place squash cut side down on a microwave-safe dish with 1 to 2 tablespoons water. Cook on HIGH for about 12 minutes for a medium sized squash. Time will vary depending on size of squash and power of the microwave. Squash is done when the shell can be pierced with a fork and the .flesh separates into strands. Bake in the oven. Choose a baking temperature between 350 to 425 degrees. Line a baking dish with foil for easier clean up. – For a “roasted” flavor, rub cut edges with a little vegetable oil (optional), place cut side down in the pan and bake uncovered. 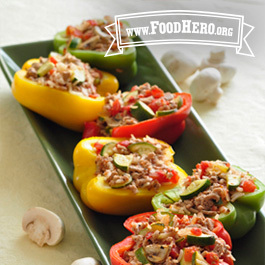 – For a “steamed” texture, add ½ cup water to the pan and cover with foil. Check for doneness after about 40 minutes. Larger squash and lower oven temperatures may take longer to cook. Squash is done when the shell can be pierced with a fork and the .flesh separates into strands. Let sit for 10 minutes or until squash is cool enough to handle. 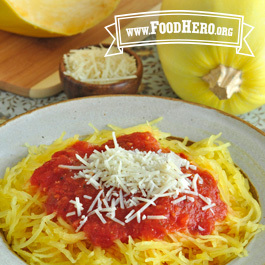 Use a fork to gently scrape the inside of the squash to make spaghetti-like strands. Refrigerate leftovers within 2 hours. Season the squash with a little salt and pepper or try nutmeg, onion or garlic powder. Top with your favorite pasta sauce. Try our Quick Tomato Pasta Sauce. Try sautéed mushrooms, onions or other veggies. Add a sprinkling of cheese. 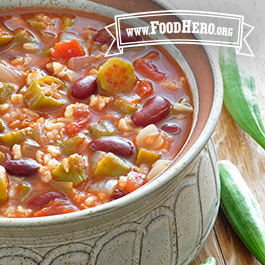 Include beans, tofu, cooked chicken, or cooked meat to make a one dish meal.